One of the problems with location flash photography is that you often only want to light part of the scene (the subject) and downplay (but not eliminate) the area surrounding the person. There are lots of expensive accessories to achieve this effect. 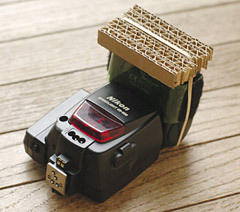 But I just read a post on the Strobist (scroll down the page until you get to the post titled "Free and So Easy: DIY Grid Spots for Your Flash"), where contributor Gut Mann designed a nifty grid for your flash head out of corrugated cardboard. Using this DIY attachment, you can create professional looking environmental portraits that emphasizes the subject, yet downplays the environment. Complete assembly instructions are detailed on the site. You can get a rough feel for the effect by looking at an assignment shoot with a snoot by the Strobist. If you're a location portrait shooter, this is definitely a trick you want in your camera bag. Photo from the Strobist website.